Herbert Beerbohm Tree was born in London in 1853. After early success as an actor he took over the Haymarket Theatre in 1887. After the box-office success of Trilby he built His Majesty's Theatre. A great character actor he played Falstaff, Fagin, Shylock and Micawber. In 1895 he put on the first production of A Woman of No Importance, a new play written by Oscar Wilde. Beerbohm Tree also helped the career of George Bernard Shaw, by producing Pygmalion in 1914. 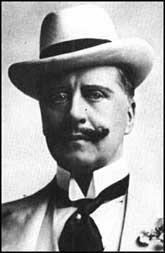 Herbert Beerbohm Tree died in 1917.